Last night my father asked me to explain what the emerging church is all about. He had been reading various things on the net and still couldn't figure it out. In some ways, I still can't either. I tried my best to explain, but found it very difficult. That's not to say that there are no answers, it's just hard to get right to the point—right to the heart of the issues involved. This frustrated me. I'm thinking particularly of the American entity called Emergent, who's goals I have wished were more clearly defined. But then it suddenly hit me why Emergent has been reluctant to un-fuzzify its boundaries. Partly, this realization was spurred on by Jonny Baker's post yesterday, in which he suggested that Emergent "should forbid anyone round the world from calling their local network emergent...and encourage people in their regions to network but to develop their own names and local take on the conversation." In the spirit of post-colonialism, Jonny suggests that Emergent's "international strategy should be about encouragement and gift - encouraging local/regional conversations that are genuinely contextual and giving away ideas and whatever else." What he's saying is that we don't want to start a franchise for our brand of the "emerging church." This isn't McDonald's and we don't want it to be. John Drane has some great things to say about the dangers of McDonaldization in his book The McDonaldization of the Church. Click here for some of my reactions to the book. Anyway, last night I was struck by the thought that in the end, at least for me, it's not about whether I call myself Emergent or part of the "emerging church." Perhaps to me, Emergent will always be a conversation that has helped to get me thinking about a variety of things. This should spur me on to focus on what matters to me most and then do something about that, whether that means research, speaking, or action. Actually, it probably should entail a combination of all three. In doing so, I may have something more to add back in to the conversation, but the conversation is not my life's work. The conversation helps inform my life's work. I don't know if all of this is making sense. I guess I'm trying to say that I'm feeling okay with Emergent's fuzziness right at the moment. Of course, I can't say what I will feel like 10 minutes from now! My wife also helped bring things into focus for me last night. She said, basically, that without the conversation Emergent has provided she doesn't know if she would still want to be a part of the church. I think this is true for so many of us. We may not be able to put our finger on or agree about all that Emergent is or should be, but we have found a conversation in which we feel a little less alien; a little more like we do belong in the kingdom of God after all. Please God, may the conversation continue! We have some control issues in the church. Let's just get that out on the table...'fess up. We care an awful lot about numbers. There is only so much Christian market to share amongst ourselves and we do our best to increase our slice of the church hoppin' crowd. We each would love to copyright our own "Statement of Belief." We'd like to engrave it on two big, bronze plaques. We'd like to include some of the words from Revelation 22:18—"If anyone takes away from this [monument to our rationalism] God will take away from his share in the tree of life!" We want to make sure everybody is teaching the right theological stuff. We wince to think that people might be going around calling themselves Christians and not acting or dressing or talking like we do. We try to stay separate from other church groups unless they're very similar to us. It's kind of like the whole interracial dating thing. We know we shouldn't have a problem with it, but still...what would people think? How will the kids adjust? Won't we just cause more problems for ourselves than we really need? We would like to patent our own version of "spiritual maturity." That way, no one can have a totally different experience of walking with Christ and claim to be mature like we are. We would like to be in control, but...this may come as a shock...we're not! And we won't be. In fact, we shouldn't even want that control. We have some control issues. I've been reflecting the past few days on the four characteristics of sociology professor George Ritzer's "McDonaldization" process: efficiency, calculability, predictability, and control. John Drane has written a book called "The McDonaldization of the Church," in which he talks about how these factors have unfortunately controlled the church. For the introduction to this series, please click here. True confession: When my wife and I were in Bulgaria for a week, picking up our adopted son, we resorted to Dunkin' Donuts, McDonald's, and KFC in various attempts to get away from the Bulgarian menu. Tip for the traveller: KFC was actually the most like home. I mention that to say that I understand the "comfort" factor—especially when it comes to my stomach. And I like to try new foods, mind you. But Jesus never promised predictability when it comes to the church. I really appreciated a post I just read by Jamie. He vents about a God he thought he knew, but who turned out to be quite unpredictable. When it comes down to it, do we really want a God who will just do whatever we tell him to do? It's hard to come to grips with this, but I don't really want a formulaic God. And I don't think we should want our churches to be that way either. Jesus did "predict" that whenever we gather in his name, he'll be there (Matt. 18:20) So what is it like to have Jesus around? Can we predict what will happen when the Son of God shows up in our midst? It seems a large portion of our society is trying to find mystery. Meanwhile, many of us Christians are trying to design charts that explain everything in simple terms. Churches like mine have completely done away with the concept of sacrament. We "remember" Christ, but we don't dare think we could make some kind of physical contact with him. I say we need to revel in God's unpredictability. We need to get on the rollercoaster ride Jesus has planned for us, not even trying to look ahead and see what twists and turns, dives and loops he has planned for us. We need to do it based on his character, not on the soundness of some imagined plan for growth. We need to think less about what the mega-church in another town is doing and dream about what would glorify God in our own community. Many of us are aware of how easily churches can get wrapped up in numbers. It seems like no matter how much we pay lip service to spiritual growth, it all comes back to how many people were in the pew on Sunday morning. Believe me, as a worship leader, I know how depressing it can be to have a sanctuary that is half full (with most of those sitting toward the back). In his book, "The McDonaldization of the Church," John Drane talks about the importance churches have placed on calculability. Like a fast food franchise, we have decided we have to place a lot of emphasis on measuring our growth, not only in the most spiritual ways. I am reminded of a booklet my senior pastor picked up at the National Pastor's Convention in Nashville. It was some sort of Spiritual Growth Assessment test. It was kind of like the typical spiritual gifts tests many of you have seen. Do people really believe they can graph the state of my soul? I don't get that. Drane tells a story about how this calculation game can backfire. There was a church in the U.K. whose attendance was suffering. The leaders of the church decided to try to open its doors to the business district it was located in. They made themselves available, in various ways, from Monday to Friday. There was a "spiritual core" involved in much of what they did. This church was "able to identify...something like 2000 people who had regular contact with the church on this basis." How do you think the church's denomination reacted? Apparently, the system in place left no room for measuring numbers this way and the church's doors were closed. How has the church become like a McDonald's franchise? In John Drane's book, "The McDonaldization of the Church," he talks about four core values of a company like McDonalds: efficiency, calculability, predictability, and control. Today, I would like to talk about efficiency. Efficiency can be helpful. Who can argue with wanting to do things in the most cost-effective, energy-conscious way? I'm reminded of the Tabernacle. On the one hand, you have a very costly, elaborate set up that must have involved a tremendous amount of work to produce. The fact that much of the equipment was either made out of or coated with gold did not exactly make it light. I could just imagine the Levites complaint: "This thing is supposed to be portable?!?" On the other hand, God designed it so that things could be dissassembled and carried. The ark had its rings through which poles were inserted, etc. But one has to wonder if efficiency was one of God's core values in planning this thing out. It seems to me that the aesthetic beauty, the sheer extravagance, and the expertise in craftsmanship were concepts that were more important to God in this case. I really appreciated John Drane's example of the welcome package. Does your church have one of these? Everything you need to know is handed to you in a slick, red folder. The visitor is dazzled by the outpouring of information organized for his easy digestion. Drane talks about the "greeter" at your typical store, who enquires about your day but basically just wants to get you in the door so she can "welcome" the next customer. I'm reminded of my local Blockbuster, where it is obvious that the employees are required to greet each and every customer. I don't know if this is true everywhere, but at my Blockbuster the greetings are ridiculously forced. Sometimes the workers don't even look up as they say, "Welcome to Blockbuster." Question: Does our society understand what the concept of "welcoming" truly means? "...the key to efficiency in the business world is being able to process as many people as easily as possible." How does this value of efficiency contrast with our call to discipleship as the body of Christ? I had the opportunity to visit Fuller Theological Seminary this past week and attend a lecture featuring George Ritzer and John Drane. George Ritzer is a professor at the University of Maryland. He is the author of "The McDonaldization of Society" and, more recently, "The Globalization of Nothing." John Drane is a professor of practical theology at the University of Aberdeen. He has written a book called "The McDonaldization of the Church," which is partially based on Ritzer's sociological thesis. Ritzer defines McDonaldization as "the process by which the principles of the fast-food restaurant are coming to dominate more and more sectors of American society as well as the rest of the world." (The McDonaldization of Society by George Ritzer, p.1) In "The McDonaldization of the Church," John Drane lays out the four principles of the McDonaldization process: efficiency, calculability, predictability, and control. Drane then talks about how these principles have guided the church. In George Ritzer's portion of the lecture I attended, he talked about the difference between nothing and something. According to his use of the word, nothing is a "social form that is generally centrally conceived/controlled and comparatively devoid of distinctive substantive content." McDonald's is the classic purveyor of nothing. There are McDonald's restaurants in over 100 countries in the world, all of which are pretty much identical. This is because they are all conceived and controlled by a centralized company. There is no allowance for distinctiveness, beyond a few minor menu alterations. Ritzer pointed out the problems involved with this worldwide production of "non-things." The products of the McDonaldization process are generic, they have a lack of local ties in space or in time, they are dehumanized and they are disenchanted. Ritzer was careful to point out that nothing is not always bad. There are positive things that have come out of this process. He is troubled, however, by the tension between McDonaldization and the seemingly more beneficial process that has been named glocalization. Glocalization describes the process by which the local and the global interact to produce something unique. Although globalization is an unavoidable product of advances in technology, this does not mean that all of the positive values of local culture will inevitably be wiped out. In fact, Ritzer has invented his own term, grobalization, to describe the growing influence of centralized organizations that inevitably overwhelm local influences. As a self-proclaimed citizen of the world, I welcome the process of glocalization. I think it can be a welcome part of the partnership between humankind and God. As we continue our role as co-creators, our integrity, compassion, and artfulness will be magnified by the interplay of various cultures. At the same time, I have been awakened to the negative effect McDonaldization might continue to have on our society and on our churches. Yesterday, I began reading John Drane's book. I have appreciated what I've read so far, and hope to comment more specifically on the dangers of the McDonaldization process in future posts. 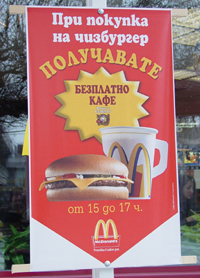 Note: The picture is of a McDonald's poster I saw in Bulgaria.